The shapes are cut from laser from gold, silver and bronze foil backed acrylic. The edges are linished and polished. The pieces are then heated to acquire a gentle curve and crazed finish. The pattern is created with a hard felt mop on the polishing motor and the backs are polished. The pieces are cleaned and drilled according to the templates for each design. 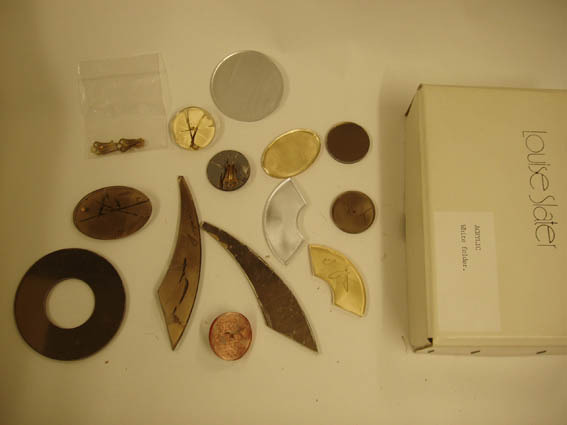 The silver findings are attached with small brass screws which have been soldered onto them. Once the nuts have been tightened the excess length of screw is cut off with a piercing saw and then the end is rivetted over the nut to secre them.